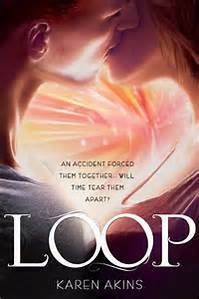 Loop, by Karen Akins (St. Martin's Griffin, Oct. 2014), is a fine YA time travel book of the sort where in the future time travel is an organized, government controlled thing. The heroine, Bree, is at a school for young time travelers, and things are not going well for her. Her mother, also a time traveler, ended up in a coma after a mission to the past gone wonky, and Bree is desperate to find some way of getting her the best care possible, which means money, which she doesn't have. Bree is also skating on thin ice academically. So things start off bad for Bree, and ever chapter the tension and difficulty of her life grows and grows until I was all like enough already, because it was making me tense. The difficulties include a boy from the past, Finn, who says that Bree loves him, but not this Bree. There is a future Bree who knew him a bit before (in his own time), but in a little bit to come (in Bree's time). So he's all expecting Bree to love him, and she's all, What? And then of course by the end she does love him (having achieved the future point at which he knew her, when she travelled back to his time). And it turns out that future Bree was doing more than just falling in love with a boy from the past. She was also engaged in a dangerous endeavor to reform the very nature of time travelling in her time, with people working hard to stop her. And present Bree is desperately trying to figure out just what the heck is happening, before its too late for her mother, for Finn, and for herself. It was the sort of time travel book where I found myself wishing I had the author on speed dial, so I could check to make sure my fragile understanding of the temporal bouncing back and forth was accurate. It was also the sort of time travel where the passage between times as an exploration of difference wasn't the point. The point of the time travel was to set up the heroine vs. those in power thriller plot, and also set up the rather interesting romance of Boy knowing Girl loves him, but Girl not knowing him yet. So kind of weird relationship-wise, but it works out in the end. And I wouldn't call the book a romance, because Finn and Bree do fall for each other, but in a context of rather more absorbing events, like foiling nefarious plots and getting Finn back to his own time. hmm. I also see that there is a sequel, Twist. I am tempted, although I think I will save it for a time when I have nothing else to worry about. Possibly the second to last week of August. I actually might attempt this one...will let you know my thoughts..thx for the review!